Part 5 of 5: In this five-part series, we provide an introduction to tensioned fabric architecture, including the history, current applications, engineering concepts, modern materials, and the innovative benefits of fabric tensile structures. Click here to read additional posts. 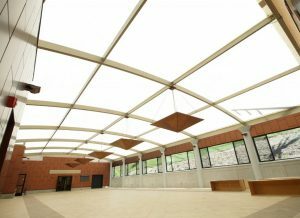 Fabric Tensile Structures (aka tensioned membrane structures or tensile architecture) provide a wealth of benefits for property owners and architects seeking dynamic solutions to modern design challenges. Today’s global economy has been a catalyst for innovation – creating a cross-pollination of ideas that’s led to better quality and more versatile options. 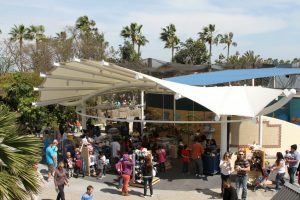 Whether you’re considering free-standing forms, roof systems, or tensile facades, here are some of the greatest benefits of designing with fabric tensile structures. If you’re working towards LEED Certification or simply value responsible building practices, fabric tensile structures are a high-impact option for achieving your energy efficiency goals. By wrapping the building envelope with advanced PTFE Fiberglass or PVC Membranes, tensile facades reduce solar heat gain and block solar glare while allowing diffused natural light to pass through. This results in a substantial reduction in the energy required for air conditioning and artificial lighting. 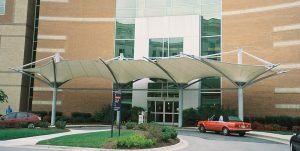 Similarly, fabric tensile structures and retractable awnings are versatile options for architectural shading solutions on smaller buildings or specific sections of windows. Many architects are drawn to fabric architecture for cost-effective rain or weather protection over walkways, entryways, and outdoor seating areas, but these structures also offer powerful solutions for water management and conservation. In high-precipitation areas, architects are often concerned about water streaming from the perimeter of structures. In low-precipitation areas, the focus may center around ensuring all rainwater can be maximized to support local landscapes. Regardless, fabric tensile structures have premium water control options that can strategically divert rainwater – towards low-impact areas, storage containers, or planter beds. Both architects and landscape architects are under pressure to address environmental change and climate adaptation in their designs. In urban settings, fabric architecture can help reduce the urban heat island effect, which occurs in areas that have a higher concentration of concrete than natural landscapes, by using light-colored membranes to reflect sunlight and glare, as opposed to it being absorbed. Additionally, continual advances in the materials used for fabric architecture supports longer-lasting, more durable structures that can withstand extreme weather events and unusual shifts in temperature. Technology allows us to be productive while outdoors or on-the-go, and modern designs must adapt to support property users’ desire to have quality outdoor experiences. 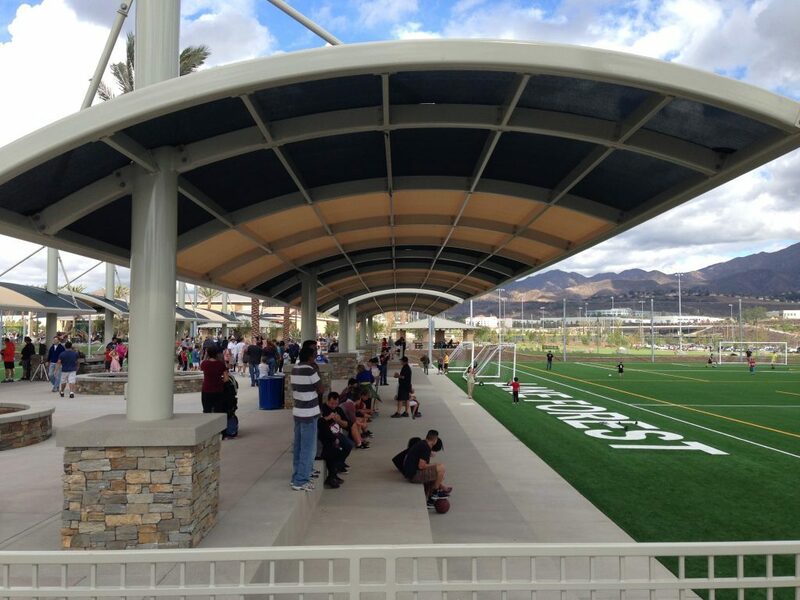 Fabric tensile structures are a cost-effective way of incorporating shade and weather protection. From structures that make bold artistic statements to graceful ones that complement the natural setting, fabric tensile structures are versatile tools for enhancing any space with style. With endless applications, the many forms of fabric architecture offer unlimited design options. 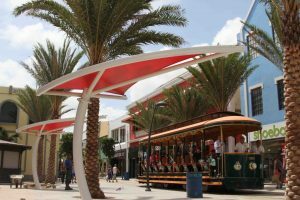 Architects, landscape architects, and designers love working with fabric tensile structures because they are able to experiment with form and shape to create exciting signature projects. Depending on the needs of the project, this flexibility empowers architects to envision living art installations that are both functional and budget-friendly. 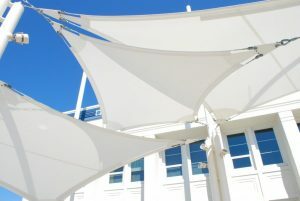 Are Fabric Tensile Structures Right for Your Next Project?